While we had the sewing machine out for the baby bedding, I figured I would work on a quick project that I have set aside since winter. I have a handful of scarves that are an awkward length scarf-wise. I don’t get all fancy with my scarf tying, but the few ways I finagled these scarves they always looked awkward because they were too short. So in the middle of this winter, I started using safety pins to make them infinity scarves. Doing so made them just perfect! Grace is an apathetic model. I had four scarves that I wanted to turn into infinity scarves. I just put the two ends together and sewed a straight line down the ends. It was a a little trickier than I had imagined to keep the fabric still for a straight line. I ended up having to use a lot of pins to keep them together so it wasn’t a complete zig-zag hem once I was done with it. So there you have it. An easy upcycle to transform normal scarves into infinity scarves. Now these four scarves that I hardly ever wore will probably see a lot more than the inside of my closet. Have you been doing any fun projects lately? Any ways to turn around a piece of clothing that may have otherwise been dead to you? While I was home for the holidays, my mom wanted me to make a specific scarf that she could wear to work. Apparently the church she works at is always cold, and she wanted something simple and warm. So while I was introducing my brother to all the wonders of the show Castle (we watched half of the first season one night), I made this. I used a N crochet needle and left over yarn from a previous project. Since I wanted to make it before I left Kansas City, I had to do something simple. 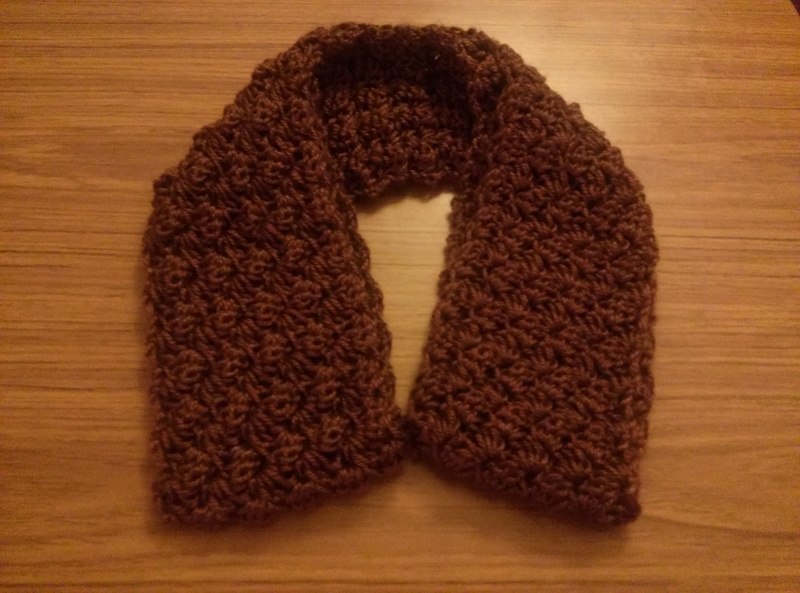 The main body is just double crochet stitches until I achieved my desired length. To dress it up just a little I did decide to add the ruffle to the side. I am pretty impressed with myself that I made this ruffle up on the fly. To make the ruffle: one single crochet, one double crochet, one triple crochet, one double crochet, one single crochet. Repeat to the ends. Surprise! I then made it an infinity scarf by sewing the two ends together. Ok, I told you I had a sickness about infinity scarves this year. 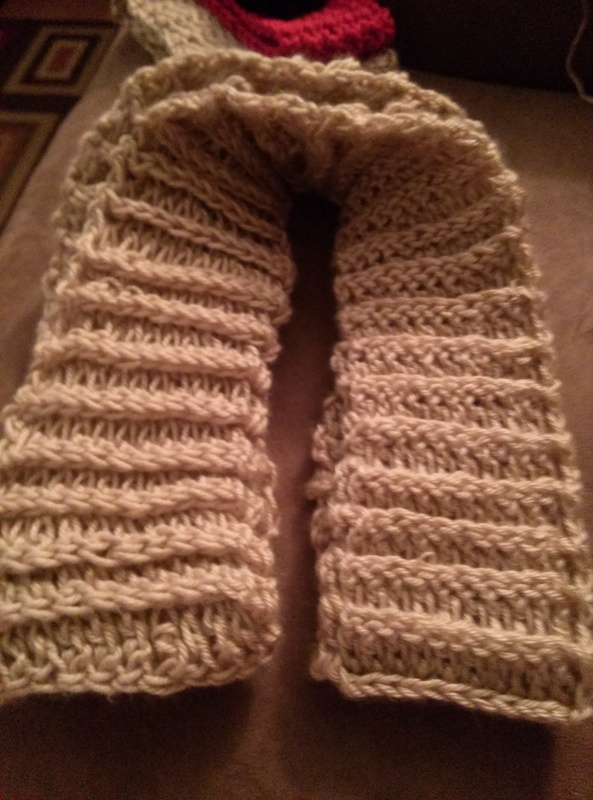 As promised, here is the scarf that matches the boot cuffs I showed on Sunday. I did this more than 6 months ago, so I don’t have specifics of how many stitches it took and the like. I do know that I learned how to do the back post stitch! A friend of mine showed it to me, but here is a pretty good video of how to do it. 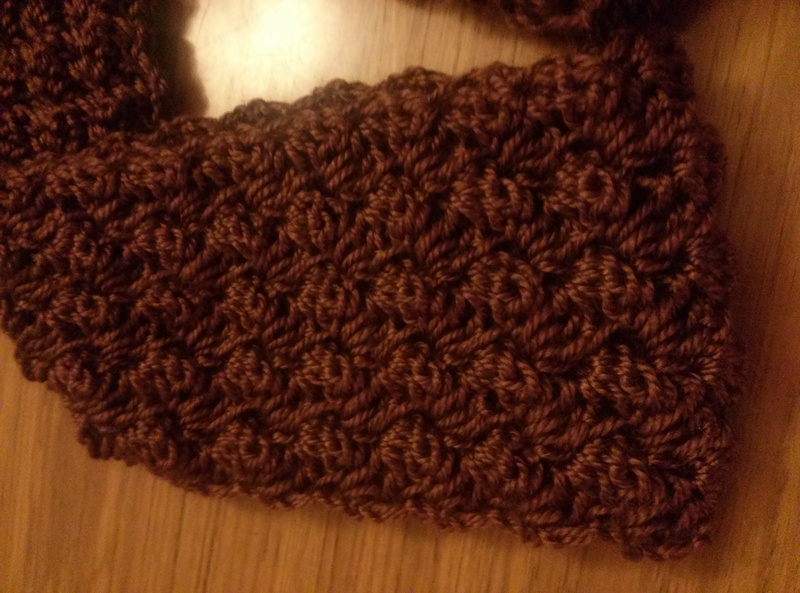 The only thing I did different is that I did not do a regular double crochet stitch in between each back post. So every stitch across the row was a back post double crochet. I really like the ripple effect that it gives. Then I used a needle to sew the two ends together so it became an infinity scarf. Fairly easy, and it was super warm too because the back post makes it pretty thick. I am not sure how this stitch would look on a blanket, but on scarves and hats it looks great!